After proving to be a thorn in the side of the planned merger between Japanese refiners Idemitsu and Showa Shell Sekiyu since 2016, the family of Idemitsu’s founder Sazo Idemitsu has now acquiesced to the wishes of Idemitsu’s board and dropped its opposition to the merger. This paves the way for the latest merger in the Japanese refining business, as the industry – once a global titan – prepares for a future of shrinking domestic demand. The merger was first announced in 2016, the first planned merger in Japanese refining since an initial wave of consolidation in the 2000s. But opposition from the Idemitsu founding family – which hold a considerable stake in the company – meant that the merger remains uncompleted, while the Nippon Oil and Mitsubishi Oil and the JX Holdings and TonenGeneral mergers sped ahead, even though they were announced later. 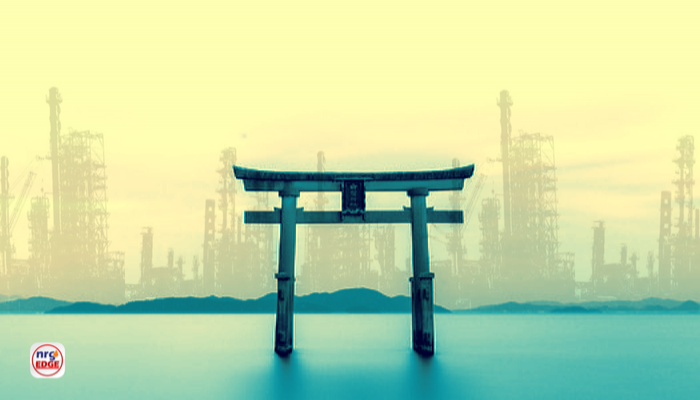 The completion of the Idemitsu-Showa Shell Sekiyu merger will slash the number of Japanese refiners from six to three, a trend backed by the Japanese government, which sees consolidation as the only way forward to optimise the industry. Although Idemitsu – Japan’s second-largest refiner – claims that no refineries will be closed post-merger, it seems inevitable; Japanese fuel demand peaked in the late 2000s and its decline is accelerating. From a peak of 4.6 mmb/d in refining capacity, consolidation means that Japanese capacity could halve to 2.3 mmb/d by 2030 – mainly by shuttering the country’s aging simple refineries. While this will increase Japan’s fuel product import bill, the Japanese government seems fine with this, given that the downstream companies will merely be swapping crude imports for product imports. But back to the Idemitsu-Showa Shell Sekiyu merger. There were legitimate concerns from the Idemitsu family regarding the logic of the merger. They argued that cultural differences between the management of both companies and geopolitical factors – Idemitsu is a major importer of Iranian crude, while Saudi Aramco owns part of Showa Shell – were insurmountable. With the US now re-imposing sanctions on Iran crude, the latter has once again come into prominence. But even when Iranian crude returned to the world market in 2016, the Idemitsu family went as far as to increase its stake in the firm – in response to a strategic share dilution designed to reduce their veto power – to derail the merger. 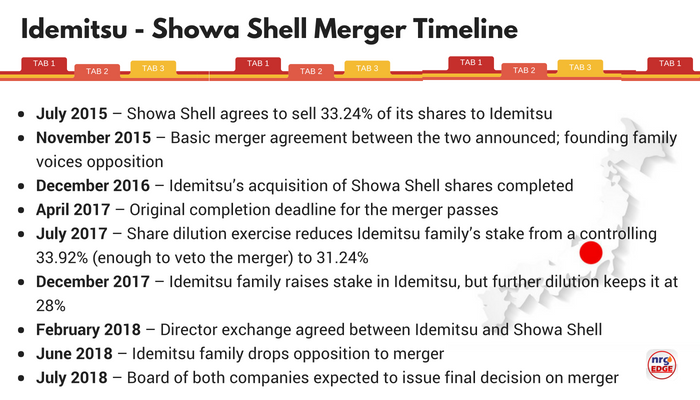 But the show went on despite their opposition – Idemitsu bought a 33% stake in Showa Shell in 2016, and since 2017 deepened ties through an exchange of directors and combining operations. A merger was always inevitable, and now even the Idemitsu clan has seen that. Even the family’s most strident voice, Shosuke Idemitsu, has fallen, agreeing on the condition that the new company ‘respect the values and principles that have guided Idemitsu since 1917.’ Two seats for the family on the board of the combined company have also been demanded. 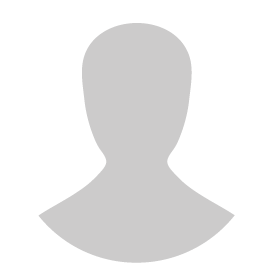 The new merged company could be formed as early as the end of 2018. 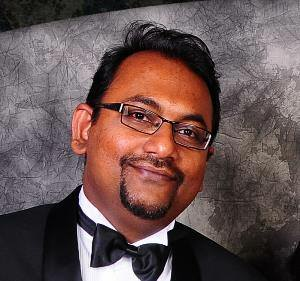 Since both firms are operating on a level just short of a full-merger, it seems almost a formality. But it is necessary. The JX-TonenGeneral merger was completed last April, now the country’s dominant player. Idemitsu-Showa Shell may form 30% of the domestic fuels market, but that is 30% of a shrinking market. As its rivals speed ahead, Idemitsu-Showa Shell can now begin to catch up.